Born in Hasur villiage (Dist. Kolhapur, Maharashtra) on 23rd Feb. 1928, to the parents Banappa and Rukminibai Mangave, he (formar name as Baburao) went on to becoming Acharya Shrutsagar. He had little formal education (7th std. passed), however being always spiritually inclined he gathered lot of knowledge by practising self-discipline, meditation and reading. The feeling of non-attachment was always prevalent, thus he took up ‘brahmacharya-vrat’ (vow of celibacy) at the shrine of Bahubali (Kolhapur Dist.) 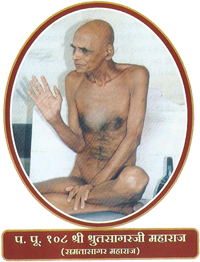 In 1971, he gave himself further for the cause, and was initiated to the Monk order by 108 Acharya Adi-sagar. He went on travelling across the country awakening the common people around towards spirituality and religion. In 1994, he became the “Acharya” Shrut-sagar. On 10th Dec 2001, owing to his ailing health, he gave up the designation of “Acharya” to 108 Shri Sanmati-sagar and took up Niyam (partial/restricted) Sallekhana for 12 years.Later, he started considering Yama-sallekhana, and subsequently on 18th July 2003 at Kunthalgiri in presence of Acharya Devnandi Maharaj, he began his Sallekhana, now being named as Samata-sagar. On 16th August 2003, he left his body.